Superfluidity refers to a state in which matter behaves like a liquid with zero viscosity. Much like superconductivity, this phenomenon occurs at extremely low temperatures and can cause a liquid like helium to behave in the strangest ways, e.g. roll up out of a container or even create a perpetual fountain. But beyond just a fascinating curiosity, superfluidity is frequently used in high-precision applications like quantum gyroscopes and even satellites that measure infrared radiation in space. With a few exceptions, superfluidity has generally been regarded as a macroscopic phenomenon, resulting from 'bulky' collections of particles rather than individual atoms. But in a recent Physical Review Letters paper, EPFL researchers have now shown that, at least in liquids, superfluidity involves dynamics that go down to the nanoscale. One of the classical parameters that is used to measure superfluidity is the critical Landau velocity. This is the cut-off velocity above which the frictionless flow of the material is lost. If an object moving through a superfluid medium exceeds the Landau velocity, it generates elementary excitations in the medium called rotons, which are somewhat similar to sound waves. The creation of rotons takes up energy from the moving particle, causing it to slow down and "gain" viscosity. In the case of superfluid helium-4, an object can move through it without friction as long as its velocity stays below ~58 m/sec. But although the Landau velocity has been experimentally verified in bulk helium-4, thus confirming superfluidity, it has never been observed in small-size systems (e.g. nanodroplets), even though these are increasingly being used in superfluidity studies. A research team led by Marcel Drabbels has now shown that a critical Landau velocity exists in helium-4 droplets a few nanometers in diameter, down to only twenty helium-4 atoms across. 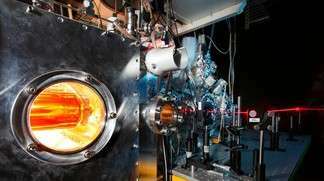 The researchers designed an experiment where a single atom (e.g. silver) or molecule (e.g. nitric oxide) was introduced into helium-4 nanodroplets of various sizes (one thousand to five million helium-4 atoms). The system was then excited with a laser beam until the so-called 'impurity' was ejected from the droplet. The ejected particle was then ionized and projected onto a position-sensitive detector. At this point, the ion's velocity in three-dimensional space was calculated and determined. The results showed that the velocity distribution for the 'impurities' was consistent with a critical Landau velocity. This shows for the first time that superfluidity can arise even in finite-size systems, and creates further questions as to the fundamental properties of the phenomenon. One question that the authors pose concerns the minimum droplet size in which a critical Landau velocity can be consistently demonstrated, which is now crucial in the design of follow-up studies. Phys.org's new advertising policy is destroying the site, making it impossible to leave soft music for the sleeping grandchildren coming from the speakers (because of ads that now blare music without being asked) and have no "contact us" or "complaint" section that I can contact. I'll be bothering everyone here until they contact me.